Hoping to create friendship and cultural exchange through music and dance, a South Korean church group brought 58 university students to Pattaya to show off traditional dress and performances. The Y.W.C.A. Bangkok-Pattaya Center organized the Jan. 28 cultural show at Pattaya School No. 7, with help of the Christians for Sports Foundation run by Pyeoung Taek Church. 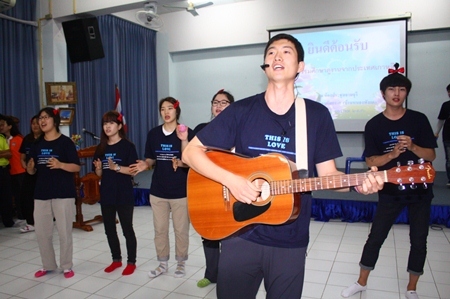 Students from Korea’s Pyeoung Taek Church perform for the students at Pattaya School No. 7. Y.W.C.A. Chairwoman Praichit Jetpai and School No. 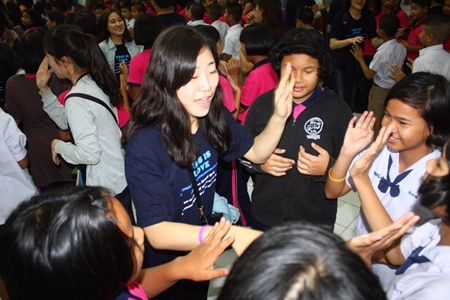 7 Principal Manus Khongwattana introduced the Korean students to 200 of their Thai counterparts from grades 4-6. The Korean group, which has run cultural-exchange programs for four years, brought 50 university students to eight Eastern Seaboard schools from Jan. 22-30. Having fun hanging with the big boys. The children talked, with translators helping increase cross-cultural understanding. Activities also included a “silent language drama,” musical performances, long drum show by students from Pattaya School No. 6, and Thai traditional dance. After the shows, students and teachers from School No. 7 presented the guests roses made from pandan leaves. The Christians for Sports Foundation is a foundation supporting youths in football. Currently, there are more than 80 youths under the foundation’s tutelage, training them to become professional football players to compete in national-level games. The girls have just as much fun playing with the older girls from Korea. Praichit Jetpai (2nd right), Chairwoman of the Y.W.C.A Bangkok-Pattaya Center, School No. 7 Principal Manus Khongwattana (2nd left), along with Bernie Tuppin (right) from Jesters Care for Kids and members of the Y.W.C.A. enjoy the show. Girls from Pattaya School No. 7 give a traditional Thai boxing dance demonstration to the beat of boys playing the long drums. Children from Pattaya School No. 7 impress the volunteers from Korea with their Ram See Nuan performance.